1 Hamilton, John C., Life of Alexander Hamilton: A History of the Republic of the United States of America . . ., Volume 7, Boston: Houghton, Osgood and Company (1879), 841, Google Books (Digital Library). 2 Hamilton, John Church, The Life of Alexander Hamilton, Vol. 1, New York: Halsted and Voorhies (1834), 2. 3 Johnston, George Harvey, The Heraldry of the Hamiltons: With Notes on All the Males of the Family, Descriptions of the Arms, Plates and Pedigrees, Edinburgh and London: W. and A. K. Johnston, Limited (1909), 121, Internet Archive (Digital Library). 4 Randall, Willard Sterne, Alexander Hamilton: A Life, New York: HarperCollins Publishers (2003), 15. 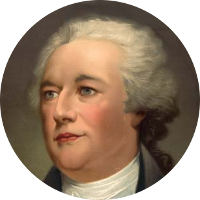 5 Wikipedia, "Alexander Hamilton", (accessed 12/31/2010).